In the grand tradition of chefs dominating their kitchens not with their culinary abilities but rather their fiery personalities, here comes Bradley Cooper to try and give Gordon Ramsay a run for his money – but try as it might to be a tasty dish of intense and riveting character drama, it instead resembles a sloppy and distasteful side-dish of contrivance (the first of many terrible cooking analogies to come in this review; you have been warned). 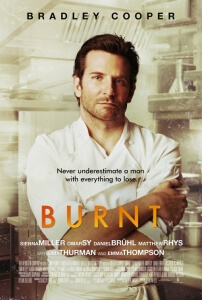 Burnt, which sees Cooper’s hot-headed chef Adam Jones attempt to restart his troubled career by taking over a London restaurant and earning a coveted three-star Michelin rating, certainly has the ingredients for something compelling, having gathered an impressive ensemble cast that is wide enough to include international actors like Daniel Brühl and Omar Sy, as well as home-grown talents like Emma Thompson and Cooper’s American Sniper co-star Sienna Miller, to act out a script by Oscar-nominated writer Steven Knight. The problem is, Knight’s script is full of things we’ve seen done much better in previous similar films, and relies far too much on the hopelessly contrived storytelling to carry it through that, despite some honest work by that impressive cast, it ends up being served on an unimpressive plate. Brühl’s character, a hotel manager who harbours a secret love for Jones, is one such example of misguidance; though thankfully his sexuality is never called out into the open to be made fun of, it never comes into the actual story and is clearly just there to give the actor something to work off of. To the actor’s credit, he does well at it; but he’s let down by a script that doesn’t seem to want to give his character anything other than a gay subplot that goes absolutely nowhere. Making things just as difficult is the fact that Cooper’s character is thoroughly unlikable throughout, and it’s nearly impossible to sympathise with him when much of the conflict that is created is very much his own damn fault. He’s already an annoying prick only ten minutes in, wearing his arrogance and pride like a golden medallion, but when we learn that he previously sabotaged a former rival’s Parisian restaurant by unleashing a legion of rats into his kitchen, and then proceeds to hire him for his new restaurant under the pretence that all is easily forgiven, he’s also a complete idiot for not recognising that hiring the very person you screwed over is a recipe for trouble. That aside, he’s a complete bully to everyone around him, even when it isn’t called for; he yells at his staff and commits borderline assault after a disastrous first day, gets Miller’s character fired from her old job so as to leave her no choice but to approach him for work (keep in mind, she’s also a struggling single mother who needs to provide for her child), and is just generally a douchebag stemmed from his sheer arrogance and dangerous determination to achieve his own goals, regardless of other people’s problems. This is a character that does not deserve our empathy despite the attempts later on in the film to soften him up, because we neither like him as a character nor do we really care about what happens to him. Sadly, because the film is so dedicated to having Cooper be front and centre despite his monstrous character making it un-worthwhile, a lot of the supporting cast is actually wasted to highly damaging effect. This is a film that gets established actors like Uma Thurman, Alicia Vikander and Riccardo Scamarcio, but literally only have them turn up for a maximum of two scenes as characters that really could have been played by anyone, and then having them go off on their merry way without ever being revisited again. People like Miller and Brühl have more to do, but that’s like saying they’re in charge of organising paperclips; these talented actors are not given much to do other than react vividly to Cooper’s sheer ferocity, and when Miller’s character is subject to a heavily contrived romantic sub-plot with him you feel the desperation by Knight and director John Wells to stick to formula no matter how outdated it is starting to feel. Knight is definitely a talented writer – besides his Oscar nomination for the script for Dirty Pretty Things, he’s also impressed with Locke, Eastern Promises and the acclaimed TV show Peaky Blinders – but Burnt is definitely not his finest hour, wasting the potential of talented actors by giving them characters who are either hollow caricatures or vastly unlikable sods, and relying far too heavily on contrivances and clichés to create a dish of real substance (last cooking pun, we promise). Burnt is an overcooked mess that Steven Knight’s script can’t shake the contrivances and clichés off of, and forces us to watch a thoroughly unlikable protagonist yell and bully his way to success to irritating effect.